After leaving the Academy, an angry young Torres eventually joined the Maquis in 2370, after former Starfleet officer Chakotay saved her life. From then on she formed a close friendship with Chakotay and she became one of his most trusted friends. At that point in her life, the Maquis became the closest thing to family she had ever had. Fighting Cardassians gave her the outlet she needed in dealing with her violent emotions. To help deal with her explosive and often violent temper, Chakotay taught her many Native American and spiritual techniques to help calm her emotions; he even trained her to speak to her "animal guide". To his surprise, she became the only person he'd ever known who tried to kill their animal guide. Torres also formed a close friendship with Seska, a Bajoran crew member in Chakotay's Maquis cell. She considered Seska to be her best friend, long before finding out that Seska was really a Cardassian agent of the Obsidian Order. The first time Torres took a leadership role in the Maquis, she led her people into a cave that she thought was a Cardassian Military installation, but she mistook unstable mineral deposits for weapons signatures. There was a rock slide and she and her team was stuck there for three days. They finally dug themselves out with their bare hands before being rescued. In late 2370, the Cardassians deployed a sophisticated automated missile called the "ATR-4107" to destroy a Maquis munitions base. However, the missile failed to detonate and Torres, who nicknamed it Dreadnought, managed to board the weapon, spending nearly a month to completely reprogram the computer to work for the Maquis and changing its vocal subroutines so that the computer sounded like her. Without authorization from Chakotay, she sent Dreadnought to attack the Cardassian fuel station on Aschelan V, but an evasive attack route took it through the Badlands, where it inexplicably disappeared. Two years later, Torres eventually found out that, like Voyager, the missile had been brought to the Delta Quadrant by the Caretaker entity. In 2371, when their ship, the Val Jean, under the command of Tom Riker, was being chased into the Badlands by Gul Evek's flagship, the Vetar, it was mysteriously transported to the Delta Quadrant by the Caretaker. After the crew was subjected to a painful examination, the crews of Voyager and the Maquis vessel were returned to their ships, with the exception of Torres and Starfleet ensign Harry Kim. Those two were sent by the Caretaker to an Ocampan settlement beneath the surface of a planet, where they were told that they were dying and needed medical care. Torres refused to cooperate and attempted to escape. Both Torres and Kim were rescued by the crews of Voyager and the Maquis. The Val Jean was later destroyed, and its crew, including Torres, joined the Federation starship USS Voyager. Since the two crews were stranded together in the Delta Quadrant, they were forced to work together as a single crew. Torres was initially assigned the provisional rank of lieutenant junior grade. Torres had difficulty getting along with the temporary chief engineer, Joe Carey, to the point of breaking his nose over plasma conduits. She was recommended as a replacement chief engineer by Tom Riker. However, Kathryn Janeway opposed this decision. After Voyager became trapped in a quantum singularity, Torres proved her skills to Janeway and earned her respect. Janeway then made her chief engineer over Carey. While exploring a nebula, Torres discovered that it was actually a living creature and that by entering the cloud-like being, Voyager had wounded it. Torres modified a nucleogenic beam and was able to heal the wounded creature. While visiting the Sikarians, she learned that they possessed the ability to fold space and travel great distances. This would have greatly reduced the length of Voyager's journey, but the aliens refused to share their technology because of their prime directive. She wanted to steal the technology or make an illegal trade for it, but Janeway ordered her not to do so. She ignored Janeway's order and arranged a meeting with one of the aliens. She was shocked when Tuvok assisted her, but the technology was not compatible with Voyager. Later that same year, Torres was captured by Vidiians, who experimented on her. A Vidiian named Sulan, who had learned that Klingon DNA was resistant to the Phage, separated Torres' Klingon and Human DNA, creating two separate individuals, one of each species. 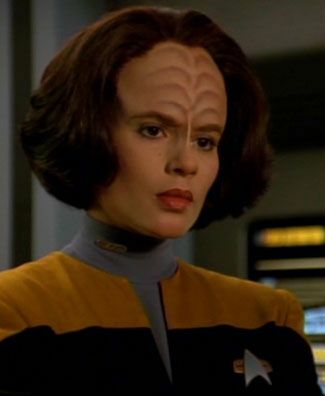 The Klingon Torres gave her life to save the Human Torres and, once aboard Voyager, The Doctor was able to recombine both elements of Torres' DNA. While Voyager was transporting a group of Enarans, Torres began having dreams of genocide against members of their race known as "the Regressives". In her dreams, Torres was reliving the experiences of an Enaran named Jora Mirell. The real Mirell was transmitting her memories to Torres. After Mirell died, Torres confronted the Enarans who denied any knowledge of the event; they left, but not before Torres was able to transfer the memories to another Enaran. Later that year, Torres was affected by the pon farr when Vorik, a Vulcan crewmate, tried to mate with her. This spurred her Klingon mating instincts which caused many problems. But after fighting with Vorik in the ritual challenge which purged her of the fever, she only vaguely acknowledged what happened. Torres reprogrammed The Doctor's perfect holo-family into a more realistic example of family life, which caused him distress but ultimately gave him a better understanding of family life and its problems. She helped end the crew's imprisonment by the Nyrians when the crew was imprisoned on a bio-sphere ship. Torres reconfigured The Doctor's optical sensors so that he could detect passages that led to different biospheres. This enabled them to access a translocation system that allowed the crew to escape. She also took part in a holoprogram about a mutiny on Voyager that Tuvok had programmed as a training exercise for his security detail. The program turned deadly after being tampered with by Seska when she had been on the ship two years earlier. Late in 2373, Voyager attempted to open an artificial wormhole that while it got Voyager back to the Alpha Quadrant it deposited them into the wrong quantum reality. B'Elanna continued to serve on Voyager continuously getting passed over for promotion like all other members of the Maquis who stayed on the ship. It wasn't until 2379 that Captain Picard who was acting CO of Voyager (slides) that B'Elanna finally got promoted to full Lieutenant.